Jeff! I'm just trying to fit in with everyone else in Chicago. Wrigleyville it is Saturday night. You're not wrong about the Irish Plague that strikes this town every March 17th, and I'm not talkin' about the spuds. It's the St. Paddy's Day Virus that turns the people of Chicago into a bunch of Blarney Stone kissing eejits. No worries, this nice Jewish boy (and his Irish wife) has already made an appearance this week at the Irish Heritage Center and I may end up at the Galway Arms for a bit of the craic myself tonight. BTW, what are those odd looking hieroglyphics in your post? Some sort of ancient Irish runes? Galway Arms is right across the street from Firecakes! Open til 10 I see. Maybe I'll pick up a dozen for the boys in the band at the pub. Or just eat them all myself. We'll see what kind of mood I'm in. I will meet you all at Polonez at 2:00PM on Sunday. Looking forward to seeing you Danny. The kitchen closes Friday at 11pm; perhaps this might interest you. It's a ten minute drive at most from the airport. This is a great suggestion! We land at 10:05 and the original plan was to head straight to Kopp's before they close at 11:00. If we do Coaches Pub, we should still be able to hit Leon's afterwards instead, since they don't close until midnight. How about 2pm Polonez dinner followed by Kopp's? Nina and I regret to inform you that we will be unable to attend breakfast on Sunday morning, as we will be attending the funeral of close friend. On a happier note, we can add abe_froeman and Mr. Maki to the guest list at Polonez. Memorable breakfast. Pictures were taken but I'll wait until BB odes his recap. My Dublin Eggs Benedict was Bomb-dot-com(R) tasty. Skipping the pre-breakfast breakfast helped immensely in my enjoyment (Thank you Gregg'n'Danny for not coming to this event and forcing me to eat too much). Pie Diva's experiment in crisp-flavoured (that's chips to you Americans) pies was an overwhelming overdose of Flavortown(R). The company was even better (Thanks again to Gregg'n'Danny for staying home and to wanderingjew for attending in spirit). Just a few notes on the afternoon session with buffetbuster and his lovely bride. We met up aroud 2:30 at Polonez for a fabulous Polish dinner. bb got his own sampler plate while Mariton, ChiBears15, abe_froeman, Mr. Maki, and the wife and I split a Cabbage Roll Dinner, a Polish Sausage Dinner, and a pile of excellent Pierogis. Among the sides were a pair of delicious crepe thin Potato Pancakes. When we ordered, the waitress asked if we wanted them served with sour cream, apple sauce, or maple syrup. This was a new one on me, so throwing all caution to the wind I committed to the syrup. And whaddaya know; the savory potato flavor worked really well with the sweetness of the maple. After Polonez we worked our way west to Kopp's. The majority of the group went with Cherry Amaretto cones while Mr. Maki and I split the Tiramisu Sundae of the Month. The most intriguing part of the day came on the way home when we made a side trip to Iron Grate BBQ to grab some carryout. I picked up a pound (four bones) of the Milwaukee Ribs along with sides of their house made Grits and Greens. I sampled both sides and fell in love with them. The Grits were incredibly flavorful and rich. When asked, they insisted there was no cheese in the recipe, so the deep and intense flavor must have been magically induced. Likewise with the Greens. They say they're a mix of Collards and Mustard Greens which is a great start. But these had a really unique flavor that played on a hint of sweet and tangy in the Pot Likker. As an added bonus they gave me samples of the house made Pastrami (limited availability through St. Pat's weekend) and their Brisket. Both were moist, tender and flavorful. The Pastrami was especially noteworthy for its intense seasoning without going overboard on the salt. Iron Grate absolutely needs to be the focus of a future Contingent visit. Maybe get a dozen or more of us in the dining room so we can order the entire menu and sample the whole slate. It was great seeing our Pittsburgh pals. Hope you had a wonderful weekend! We had a great weekend in Milwaukee. Still one of my favorite cities and I wish it was easier for us to get to. 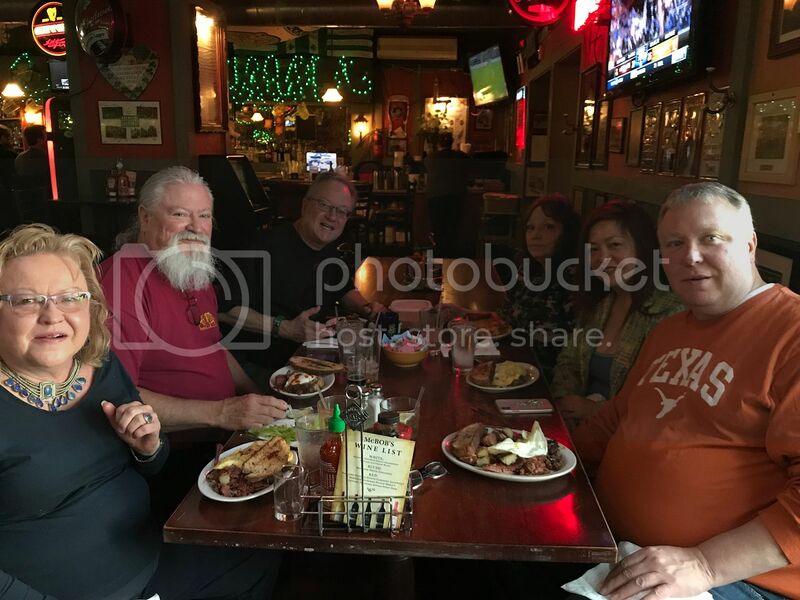 On Sunday morning, Jeff and Bobbi, Mike and Beth were nice enough to join us at McBob's for the best corned beef hash on earth. topped with brittle. 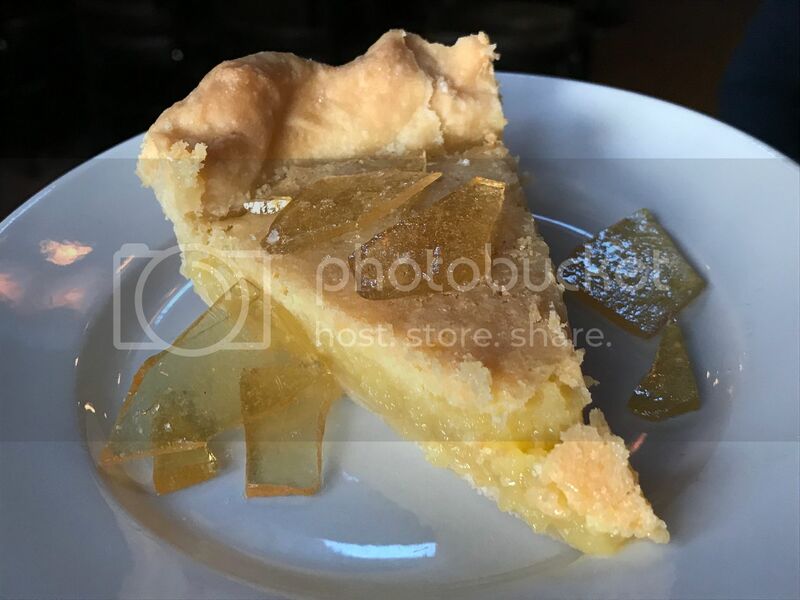 It reminded me of a chess pie and was delicious! Meanwhile, Danny had arrived in town, so we drove over to Leon's to meet him for strawberry frozen custard. while the other six split four entrees. 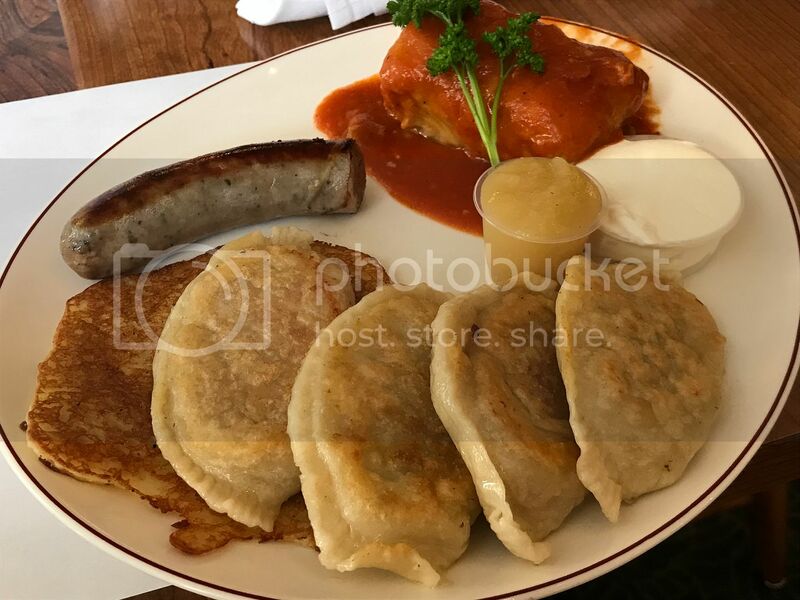 This was my second visit to Polonez and I thought the food was much better this time. before we had to head off to the airport. Thanks again to all who joined us. It was wonderful to see everyone! Order a spicy Bloody from McBob's and even the pickle has a bite. My Guinness chaser cooled the palate. Most bars in Milwaukee offer a chaser (small glass of beer) with your Bloody Mary or Maria. 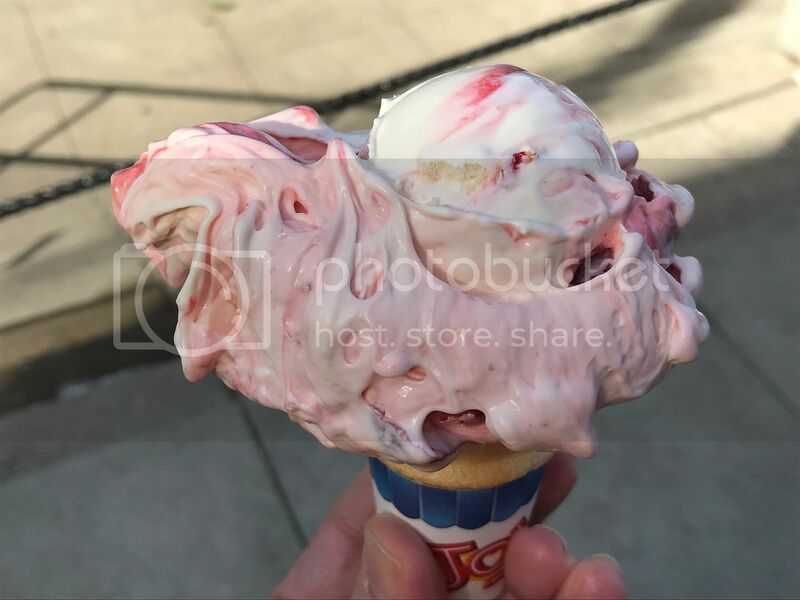 buffetbuster- do you recall what the flavor of the day was at Kopp's? Cherry Amaretto Cheesecake. Sorry, didn't mean to intrude on a private internet conversation. I was thinking back to the days when buffetbuster was young(er), naive, single, and impressionable. So I did a search for his classic four breakfasts before 11:00 thread, not realizing that this was his first time ever at McBob's and first time eating their corned beef hash. This occurred just over ten years ago. Read it again. This never gets old. It is probably my favorite thing I've ever read on Roadfood.com. I did all that in one weekend? Man, I am really slacking nowadays. Thanks for posting that JRPfeff. It brings back great memories, including some places that are long gone. Posing with a beautiful woman, while eating strawberry custard still wasn't enough to make him smile. Maybe it was his DOC shirt. There are 2 unseen hands in that photo. I'm not accusing anyone of anything, just saying. Coincidentally, Mariton and I will be back in Milwaukee the same St. Patrick's Day weekend this year. We are getting in late enough on Friday night that we will most likely just hit Kopp's (black raspberry and chocolate chip cookie dough) and then go direct to our hotel. Saturday morning, we are leaning towards Benji's for hoppel poppel before heading north, if the weather cooperates. We are planning on spending Saturday night in Green Bay. We should be back in Milwaukee by mid-afternoon Sunday. Any Wisconsinites available for breakfast Saturday morning (we want to go early and they open at 8:00AM) or a late lunch Sunday afternoon? The Kopp's forecast for that Sunday is Bailey's Irish Cream Coffee and O'Mint Chip. How late are you arriving Friday night? Unfortunately, I'm working both Saturday and Sunday that weekend, so a late night bite on Friday might be our only opportunity to see you on this visit. The following weekend we are coming to Chicago. How about we see you then? How about I start a separate thread on that.